Basement waterproofing has evolved with time to become such a complex procedure which needs experience and expert knowledge in its execution. Contrary to what some homeowners think, basement waterproofing is much more in scope than just filling of cracks and spraying sealants. For purposes of distinction, basement waterproofing is divided into two major areas which are exterior and interior waterproofing. However, I’d like to focus on the importance of exterior waterproofing. Its simplest definition refers to the many different waterproofing procedures conducted on the outside of your home. It involves excavation because basements are buried underground. Exterior waterproofing aims to stop water from trickling in through the basement walls. Traditionally, these waterproofing procedures were done as a response to damage in older homes. Currently, waterproofing has been incorporated as a procedure in the construction of new homes. Cracks often begin on the inside of your basement and slowly develop through your foundation and ultimately become visible on the outside as well. Crack repair is a process of sealing and filling in these cracks. Although it is a time-consuming process, it is absolutely necessary to having a dry basement. In this procedure, a thin layer of mortar is applied over a masonry or concrete surface. Parging helps accomplish a number of goals amongst them a smooth foundation wall as well as filled up holes, gaps, and voids. The end result is a stable and more solid basement wall surface. 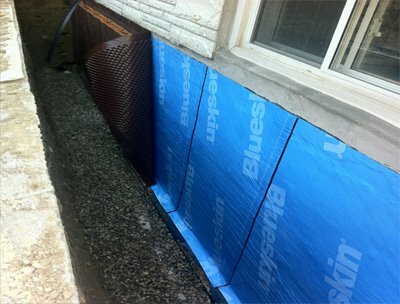 A waterproofing membrane essentially helps to seal your basement walls. It is normally applied on the outside of foundation walls and this establishes a barrier between the ground water and the walls. Most modern membrane systems are long-lasting and have the ability to withstand not only the water pressure but also the cold winter temperatures. 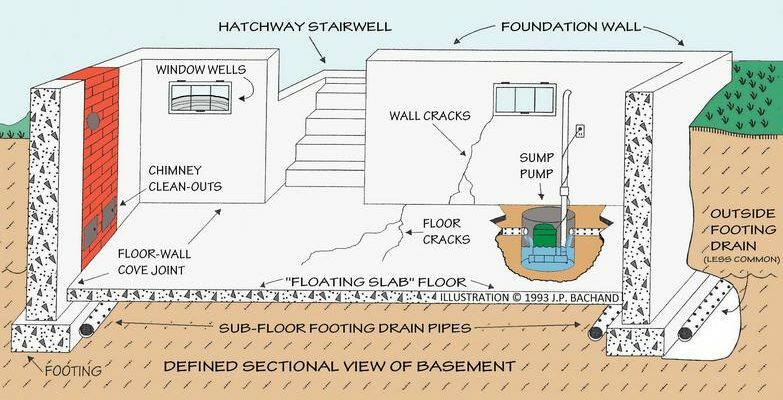 Wet basement problems could be caused by a number of factors amongst them bad grading. When the location of your house relative to the neighboring homes is much lower, chances are high that you could experience flooding. If your property is graded in such a manner that it slopes in the direction of the foundation, the risk to flooding is even much higher. While it is appreciated that you can do very little to reshape the entire landscape of your home, there are things you can do such as regrading to help ease the strain on the basement walls. To add onto the above procedures, contractors may also design French drain systems to enhance the drainage system in your yard and in particular around your foundation. This will lead to fewer soggy spots and alleviate pressure on the foundation walls.